"He came out from the porch of a building armed with a pistol in his hand, his arm outstretched." 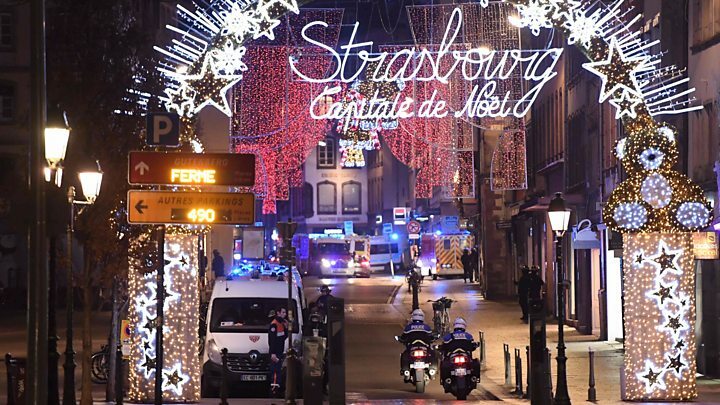 One eyewitness to the shooting in Strasbourg told French media she stumbled into the path of the gunman - and was lucky to survive. Audrey was one of many people taking in the Christmas markets with some friends when the first shots rang out. "He headed towards a gentleman walking in front of me and immediately fired a bullet at his head," she told Radio Monte Carlo (RMC). "The man collapsed, and the guy opened fire again at someone else who fell to the ground too," she added. Her two friends ran, screaming. Audrey was left standing face-to-face with the shooter, paralysed with fear. "He turned around, I was facing him," she told the radio station. "He ran off and went under another porch." "Why didn't he shoot at me? I don't know. I think I was extremely lucky. As everyone was screaming, he fled." Another witness named Jonathan was working as a waiter when he heard the gunfire. "I thought it was our slate that had just fallen outside," he told Dernières Nouvelles D'Alsace. But then he discovered a man lying on the ground, bleeding. He quickly retreated inside and barricaded the restaurant, telling all his customers to get down. But then he discovered the injured man had not been alone - and had been waiting outside for his family. "The wife, who was with her son in the restaurant, was in the bathroom - and when she came out, we had to tell her that her husband was shot," he told RMC. "He was losing a lot of blood"
"I heard the gunfire and ran towards the shots," François told the local L'Alsace website. The 34-year-old resident had been walking nearby when the attack happened, and found a man in his 50s lying wounded on the ground outside an ice cream parlour. He phoned his brother, a doctor, to ask how he could help. "He explained to me that I had to compress the wound, but I could not find the bullet entry wound," said François. "He was losing a lot of blood." A passing cyclist then stopped and told him she was a doctor and gave the man heart massage. He never saw the gunman, and the fate of the wounded man is not yet known. He ran off past a local cinema, where people were "walking quietly down the street, who had not heard". He warned whoever he could. Eyewitness Pater Fritz told the BBC about a similar experience. He heard gunfire and found a person who had been shot, lying on a bridge. He said he tried to resuscitate him - but the man died. "There are no ambulance services able to enter the area, apparently," he said, adding: "After 45 minutes we stopped the resuscitation [attempt], because a doctor told us on the phone that it was pointless." In the nearby basketball stadium, sheltering residents broke into a rousing chorus of the national anthem in solidarity with the victims - something which was widely played on French television. But one of the people there, Benedict, told RMC: "I was not able to sleep, I was too shocked, I had too many emotions," and the he went for a late-night walk later instead. 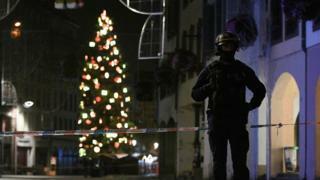 "Two snipers stood in my window"
Another Strasbourg resident was caught up in the drama when two police snipers took over her living room. From her first floor apartment, Michèle heard shots and screaming and then police banged on her door., according to Dernières Nouvelles D'Alsace. They told her "there was an exchange of fire with the shooter, and that he had taken refuge at number 5 rue d'Epinal, directly opposite my home". "They set up in the living room and moved my couch. A crack marksman stood at the wide-open window, his foot planted on a chair," she said. A second sniper joined the first a little and for a brief moment the shutters opened on the opposite window, but quickly closed. "They shouted out 'it's useless trying to hide'." Police then bashed down the door at number 5 and checked the neighbouring buildings - but the suspect had slipped away.